Demoing is my favorite part of the renovation. Despite dust and debris, it usually leaves a much cleaner and simpler state for us to work with. Most of the things we have done during the five months living in this house are demos: old carpet on the main floor, stinky carpet on the stairs, satellite dish on the roof and wires, rusted metal awnings, broken concrete patios, window wells (here and here), a wall or two, and a backyard garden shed. Our ranch must feel 1000 pounds lighter now. And last weekend, garage ceiling got its turn. To break it down, Slav removed all the drywall ceilings with a pry bar, and I was on the ground cutting the drywall into manageable pieces using an utility knife. While I bagged all the drywall pieces in big trash bags, Slav went around and removed all the nails, screws, and ladder hardware from the bottom chord. The ridge opening is covered by ridge vent, which is designed to let moisture and heat out of the garage. Slav also removed many random boards and lumber nailed onto the bottom chord. Many of which do not have any function. He did leave one section intact. The southeast corner of the bottom chord has several really nice boards on top. We decided to keep it as a potential storage. One step closer to our cathedral ceiling! It was organized, but far from renovated. Most of the walls and ceiling are still the original and full of nail holes. You can see that we have already replaced the weather stripping around the garage door and leveled the concrete slab at where it has settled. These steps stopped almost all the winter draft coming in from the garage door, which helps the garage to stay warm in winter. Our next task, is a completely overhaul of the garage ceiling – including replacing the ceiling, adding insulation, and updating the electrical. Here is what the garage ceiling looks like. The problems are…many. I do not even know where to start. Let us put it this way, I cannot think of anything good to say about this ceiling, at all. It is a random collection of drywall pieces. You can see that some seams are taped, while others are not. This ceiling not only seriously lacks form, but also function. There is no insulation whatsoever above the ceiling – just imagine this garage is an abandoned, broken barn. The electrical in this garage is also a mess. There is only one electrical outlet on the ceiling, and not many light sockets. As a consequence, all the lights in the garage are interconnected with loose wires. Although the ceiling looks terrible, the roof structure is no doubt in a good shape. With a new roof over the garage, we feel pretty good about our starting point. We believe that with a completely ceiling overhaul and some new lighting, we can make this garage a really neat place. The piece of drywall above the bottom chord is our current attic access. We plan to replace it during the ceiling work. In our city, the code requires the attic access door in attached garage to be 20 minutes fire-rated, and self-closing. As the ceiling coming down, you can see the stuff stored there and left to us: paneling, screens, and interestingly, a whole plastic bag of receipts. The roof pitch is 4:12, which is not steep at all. But over the whole span of the roof, the highest point is over 4 feet above our existing 8’4″ ceiling. I cannot help but thinking how great it would be to keep a cathedral ceiling here, instead of installing a new flat drywall ceiling. It will not only makes this compact garage feeling more spacious, but also save all the effort and cost to drywall and mud. And think about the cool lighting we can have instead of standard can lights! I had the idea brewing in my head for weeks before discussing with Slav. He was immediately on board! And not in a tolerating kind of way, but in a “Great idea” and “Let us do it” kind of way. 🙂 I am such a lucky woman. So now the question became: how do we insulate the ceiling, and what do we use to as ceiling finish? We decided to go with the same 5-mm plywood that we used on the garage end wall. It is light and easy to work with, and has a nice finish. We can put fiberglass batt insulation right between the plywood and the roof, just like in the walls. The plywood will not only cover the insulation, but also hold them in place. 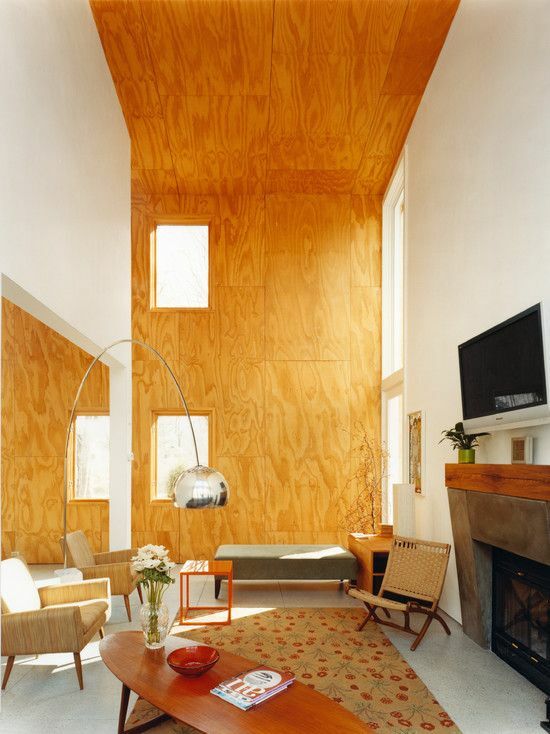 I am excited about using the same plywood finish on the ceiling as the end wall. The continuous wall to ceiling treatment should draw the attention up, especially with white walls flanking it from both sides. It should make the garage feel deeper and taller, something like this. With a solid plan in place, we are just waiting for a warm weekend to tackle the garage ceiling project. As of today, half of the garage ceiling has been removed! So stay toned, friends! The tall ceiling is coming!